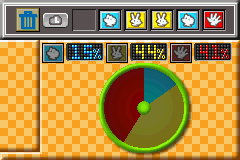 Predictotron is a Gaddget found in Mario Party Advance. It can be earned by completing the quest True-Blue Boo. The Predictotron is used to predict the most likely outcome of the next move played in a game of Rock-paper-scissors. Initially, the list is blank, and the first move is played blindly. Once a turn has been completed, what the opponent chose in the preceding round is recorded. The Gaddget then calculates the probability of each outcome and tells the player which outcome is the most likely to occur. The player should then act accordingly. "Study your opponent's patterns and learn how to predict his every move!" This page was last edited on March 22, 2018, at 17:05.